In this favorite story of long ago, you'll meet the unforgettable March sisters -- Meg, Jo, Beth, and Amy. They live with their mother, called Marmee, in a small house next to the Lawrence mansion. Their father is an army chaplain, away during the Civil War. You'll enjoy getting to know the sisters and sharing the adventure of growing up. Meg is plump and earns money by caring for children in the neighborhood. Jo likes to write and make up stories and plays for her sisters. Beth is gentle and quiet and enjoys knitting by the fire and helping with household chores. Amy, the youngest, wants to be an artist. 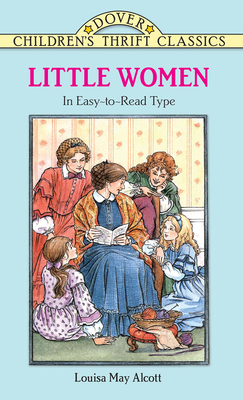 As you read or listen to this specially abridged version of the story, you'll be there as the Marches share Christmas breakfast with a poor family; as Jo sells her beautiful long hair to buy a train ticket so Marmee can visit Mr. March; as Beth falls ill with scarlet fever; and as the sisters become grown women who fall in love and get married. Reprinted in large, easy-to-read type, this edition includes 30 illustrations that capture the joy and sadness of this wonderful story of a close-knit family in nineteenth-century America.